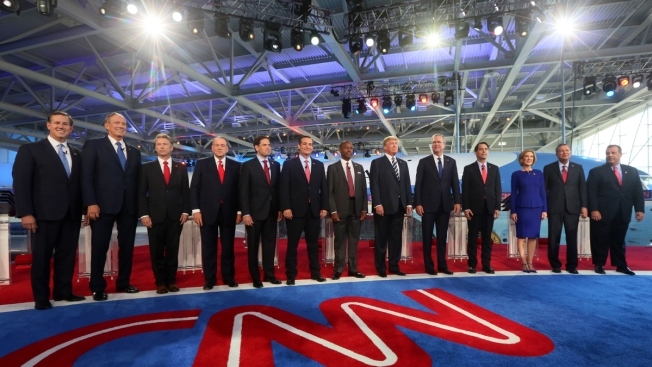 Eleven of the Republican 2016 presidential hopefuls met on stage Wednesday night in California. Di Lothrop of Nashua: One thing I can say is I went into the debate liking Carly (although not supporting her) but I hate to say that after her performance tonight I've changed my mind. She came across as cold, hard, and spiteful. She needs to lighten up. Bush needs to wipe that stupid grin off his face. Christie had a few good lines. But, it is tiresome that Trump and Bush have had the lions share of time and we haven't heard enough from others. I'm disappointed that Cruz didn't get enough time because he has a LOT more to say. DJ Bettencourt of Salem: Marco Rubio, Chris Christie and Carly Fiorina were the adults on the stage tonight in a debate that was poorly moderated and an atmosphere that at times resembled a raucous circus. Every candidate had a good moment or two but the GOP needs the opportunity to display more substance to win over the voters that decide General Elections. Brian Griset of Exeter: Didn't like the format by CNN. Seemed every question was designed to pit one candidate against another - "personally." Result, not enough focus on issues as 3 hours could have. All candidates did well tonight. I think biggest winners were Carly followed by Rubio. Ed Brooks of Salem: Winner Marco Rubio, Trump second. Zakariah Johnson of Portsmouth: Most interesting thing 4 me is now 2 of the top tier suggest ending the War on Drugs - Paul & Fiorina. A good start. Bush - again seemed to stumble and stay in the shadow of Trump. But had at least 2 good moments. Trump - it started out as The Trump Show but mercifully after a while that seemed to fade. He expectedly gave low substance answers and attacked Rand Paul a lot. Fiorina - one of the strongest performers on stage tonight. Had a couple of really big moments. Huckabee - one of the forgotten candidates on stage but true to his well known oratory skills he made the most of his time. Rubio - very solid performance. Good answers on almost every question. But will it translate to better polling? Cruz - known as a skilled debater he performed well given his time. He allowed Bush to get the better of him in a debate about John Roberts. Carson - charming and likeable but seemed shaky on some policy questions. Paul - received little time but was able to flex some muscle fighting with Trump. Walker - faded into the pack and did not stand out much. Christie - when he got chances he performed well on foreign policy. Delivered a ponderous angry attack on Carly who was defending her HP record. Kasich - not as big a performance as in the last debate. Blended into the crowd tonight.